Today Jenni meets Tuire and Wojtek, the creators of brand new children’s book Message in a Bottle. Can you tell us a bit about yourself. Who are you and what are you doing here? Tuire, 24, and Wojtek, 39, are the founders of a book publishing start-up company Blueberry & Pie which creates books with a customized message for children. Finnish born Tuire, is the CEO and the Illustrator of the company while Polish Wojtek is taking care of the finance even though they both admit being equally involved in the company’s daily operations and developing and executing its business strategy. The company was founded 1 year ago when Wojtek had made redundant at Skype and Tuire had just finished her studies in in Belgium. They both were looking for something to do and the idea of an own publishing company was born as a result of combining their skills, passion and interest towards illustration and entrepreneurship. Creating books had been on their mind already for some time and once the opportunity came, they didn’t hesitate to grip it. Can you tell Barefoot in Luxembourg readers a bit more about your book project? 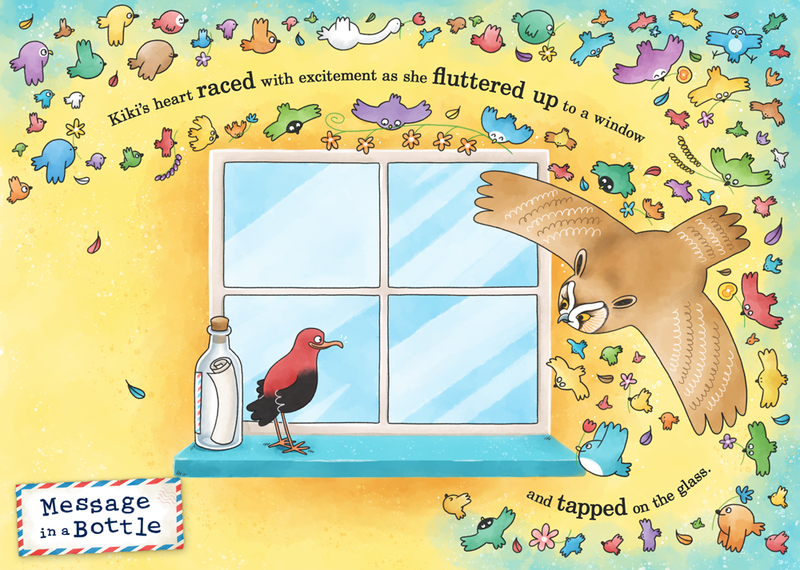 Blueberry & Pie’s first book Message in a Bottle was launched on 26th of August, 2016 and it is a story of Scarlet Hawaiian honeycreeper bird Kiki who finds a message in the bottle and decides to deliver it to the intended person. She can only see the first name of the person in the beginning of her trip but on her way from Hawaii to the final destination she discovers parts of the message once it is fully revealed in the last page of the book. 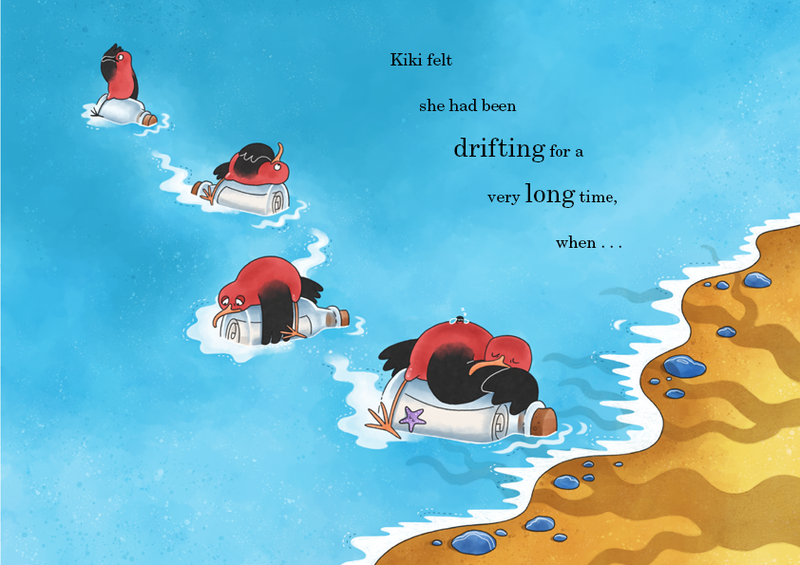 The adventure takes Kiki from the tropical Hawaii to cold North America all the way to sunny South America until she makes her way to Europe. During her journey she discovers local animals who help her to reach her goal: “ The story isn’t only educational from the geographical point of view but also teaches kids that everything is possible with the help of others”, Tuire summarizes. The animals that Kiki meets have been selected with the help of biologists in order to provide a realistic picture of their habitat. “I hate when polar bears are placed on South Pole or penguins in the North Pole” she adds referring to false presentation of many animals’ geographical home in some children’s books or cartoons. The idea with the personalized message is that each person ordering the book writes the final message by themselves and thus making it very unique and fitting to the occasion no matter if it is a birthday, Christmas or a get-well present. This is possible because the books are printed only on demand and hence the buyer can really customize the message he or she wants to communicate to the child. It could simply be a greeting from an uncle but also a special memory from last summer written down by the grandparents. Why people in Luxembourg should be attracted by your project? Luxembourg is full of expats and other international people who are constantly looking for unique presents for the birthday of their friends’ kids, baby showers or baptisms. Children living in Luxembourg also learn English already from very early age so this could be also one way to enhance their learning process. The biggest challenge was just to get started. Neither Tuire nor Wojtek had any idea how to start a business and how much work it would require. They didn’t know anything about publishing nor had any contacts in the field, which made the beginning even harder: “ Publishing industry is a very closed field and without contacts or proven reputation, nobody takes you seriously” Tuire elaborates referring to the process of finding the right people to work with. “We were also struggling to find the exact storyline that we were satisfied with” Vojtech adds. Both agree that the most rewarding thing is just to see the book becoming true and see that the hard work has paid off. “We want to make a series of books where Kiki goes on adventure in different continents. For example, a story where the journey starts from Australia and takes a round in Asia before finishing in Europe. In this way, a family with several kids could have same book with different stories” the business partners explain. This is, however, a long-term goal and at the moment all focus and effort is being directed to make the first story available. It has been 4 years since Tuire first came to Luxembourg as an au pair and 7 years since Wojtek began his work at Skype. Tuire and her inner child like the park in the city center where you can find the big wooden ship made for kids. Wojtek in turn prefers the Grund area. Both of them are big fans of sushi and gladly eat out food that isn’t easy to make at home Kamakura is the favorite sushi restaurant in Wojtek’s opinion while Tuire likes Yamayu Santatsu: “the name that I can never pronounce” she admits. As a beer fan, Wojtek enjoys BBC or the Big Beer Company due to their big selection of beer but Tuire rather stays home zipping whiskey and reading Donald Duck cartoons.They both admit not being very big night owls. Tuire praises nature, especially Mullerthal region and its endless hiking paths. Wojtek follows the same truck of his colleague and likes the combination of easily accessible nature but also international atmosphere of the country. “Berdorf is definitely worth of visiting; it has beautiful cliffs, offers a possibility for climbing and they call it the Little Switzerland” Tuire recommends as a nature loving person. How would you describe Luxembourg in three adjectives? Luxembourg is rich, green and international for Tuire. Wojteck finds it charming, advanced and open. Message in a bottle is available for purchase on their website https://www.messageinabottlebook.co.uk at the price of 26 EUR.